2) ENGINES OF SUCCESS 2009: WHAT A NIGHT! 7) IT'S TRUE WHAT YOU HEAR: NEW GEAR! Visioning Day 2009 took place on June 20 at the Hampton Inn Ottawa Conference Centre. More than 80 people with intellectual disabilities and their family members plus staff and board members came out on a Saturday morning to talk about future directions at LiveWorkPlay. The introductory discussion was designed to take a look at current LiveWorkPlay supports and services and talk about their relevancy in the context of the dreams of people with intellectual disabilities and those of their parents and siblings. Initially the discussion took place in separate breakout sessions. Parents talked about how the dreams they have for their children are challenged by fears. Many stories were shared about the daily struggle to find a balance between the dignity of risk and protection from harm. There was also discussion about how LiveWorkPlay can continue offering a suppo rtive environment where people belong, while at the same time promoting engagement and inclusion in the broader community. The teens and adults with intellectual disabilities were excited and also anxious when talking about their dreams. The most difficult area of discussion had to do with sexuality and relationships. Many individuals were concerned that their parents or others would disapprove of their dreams. What the individuals in this group wanted should not be surprising, because it is what most everyone wants: to have a purpose in life, to love, and to be loved. What became clear in this discussion is that people with intellectual disabilities experience many barriers in pursuing their dreams, and that well-meaning paid and unpaid supporters in their lives often contribute to that challenge. Everyone came together for the final hour with special guests Paul Melcher and Noreene Adam from Community Living Upper Ottawa Valley. Noreene shared her story from the perspective of a mother who has been learning to step back so her son can live his own life. He has made many choices for himself that were quite different from what Noreene may have wanted. But he is happy, and he is in charge, and that is what is most important to her. Noreene credited the trusting and mutually respectful relationship with her son's support staff as critical to her ability to evolve her own role in her son's life. As Executive Director of Community Living Upper Ottawa Valley, Paul followed up Noreene's story by explaining the work of the association to move away from program-oriented thinking to supporting individuals to engage with and be engaged by their local communities. The association made some difficult decisions to discard much of their traditional infrastructure to focus on helping individuals realize their dreams. The board and staff will be discussing the outcomes form Visioning Day 2009 over the summer and following up at the Orientation and Annual General Meeting on August 27. 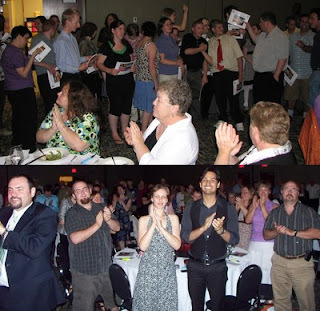 ENGINES OF SUCCESS 2009: WHAT A NIGHT! A packed house of more than 200 came out on June 25 to celebrate people with intellectual disabilities and recognize individuals, businesses, and organizations that support them to have a good life. Engines of Success has always been a popular event, but this year's audience was the most diverse of all time, thanks to the many community partners that were in attendance. This year's event featured guest speakers Keith Powell, Executive Director of Community Living Ontario, and the Honourable Madeleine Meilleur, Ontario Minister of Community and Social Services. Mr. Powell talked about the value of relationships and community, noting that while supports and services are important, he reminded the audience that having a place where people can come together around a shared vision of hope and progress has a value far beyond what supports and services alone can offer. Minister Meilleur talked about the work of the Ministry in closing institutions and supporting the ongoing development of an inclusive society, and credited LiveWorkPlay and like-minded organizations with their forward-thinking approach and ability to influence government policy. She assisted in a number of award presentations that were introduced at this year's event. Robert Jarecsni, Gillian Gillespie, Melissa Cunningham, and Carl Sanderson were the inaugural recipients of the annual Personal Growth Award. Jennifer Harris received the first ever Ambassador Award, and Caroline Matte was the recipient of the Life Journey Award. Two Legacy Awards were given out, the first to long-time volunteer Pennie Styan, and the second to Bank of America (Ottawa headquarters) represented by June Larkin for their partnership with LiveWorkPlay that has been ongoing for more than ten years. There were so many special moments throughout the evening that it is impossible to mention all of them, but one of the clear highlights was the music of David McKillop, who performed a song that he wrote after leaving the Smiths Falls institution. David's voice and guitar struck a chord with the audience, and he was surprised by a thunderous 40-second standing ovation. This was followed by a three part year in review slide show that brought many audience members to tears before the evening wrapped up with door prizes. You can click on these links to watch the Journeys, Work/Travel, and People Power shows. Special thanks to Alastair McAlastair who MCed the event the entire evening without a break! Former host of Bob-TV, Alastair appears frequently at the local Yuk Yuks comedy club and other venues across North America. Active Community Experiences in Summer (ACES) offers teens and young adults with intellectual disabilities who are still in school the opportunity to plan and experi ence a trip! This year there are two different small groups heading to Toronto for three nights. Each group will decide on mode of travel (bus or train) and what they will do with their time. The first group has already made the decision to travel by VIA Rail and they have agreed on a jam-packed agenda that includes the CN Tower, Canada's Wonderland, Medieval Times, and Famous People Players. 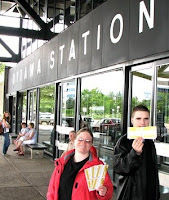 Heather and Gage (pictured) went down to the Ottawa Train Station and picked up the tickets for departure on July 6. You can follow the ACES on their summer journey with the ACES 2009 Facebook Group. After a challenging morning of talk about the future at Visioning Day, the after noon was all about fun! Betty and Ivan Harris were once again the hosts of this longstanding LiveWorkPlay tradition. The weather threatened, but cooperated. 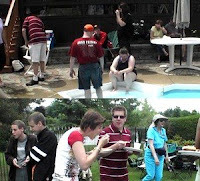 There were tons of potluck appetizers and desserts, and of course barbecued hot dogs, hamburgers, and veggie burgers. The cannonball contest was a hotly contested affair, with newcomer Ryan Nevitt earning many oohs and aahs in his battle with Daniel Harris. In the end a group of impartial judges ruled the contest a draw, with Ryan and Daniel sharing the glory. 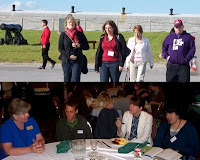 A huge LiveWorkPlay contingent took part in the annual Community Living Ontario conference in Kingston. This included 8 people with intellectual disabilities, 8 staff members, and parent Elaine Murphy for a total delegation of seventeen! Most of the group arrived by bus on Tuesday and were ready to roll for the pre-conference on Wednesday. The most popular session of that day was with film maker Anthony Di Salvo who talked about the importance of video as a way for people with intellectual disabilities to tell stories and connect with their communities. Thursday was a long day that started with morning and afternoon conference sessions but was capped off with a great banquet under a giant tent on the grounds of Fort He nry. On Friday Jennifer Harris, Julie Kingstone, and Keenan Wellar presented at the conference, sharing speaking duties for a well-attended 90-minute session about partnerships, community, and the organizational and personal journeys involved in people with intellectual disabilities moving to a home of their own. There was a real buzz in the air with questions that continued well after the official conclusion of the presentation. 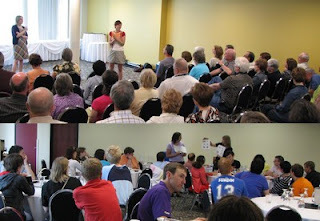 Julie and Keenan remained in Kingston on Saturday for the Community Living Ontario Annual General Meeting. Having previously participated in a special gathering in Gananoque to discuss "The New Era" of the community living movement, they were happy to share in the AGM excitement with the adoption of a Call To Action resolution that sets the stage for the work that lies ahead in building a truly inclusive society. A reminder: if you have not done so already, please sign the Institution Watch Declaration of Support for Community Living! The LiveWorkPlay Golf Tournament 2009 takes place Tuesday, September 1, at the GreyHawk Golf Club, 4999 Boundary Road. Please register a foursome online or for three golfers or less, use our printable registration form. Special thanks to Quelmec Loss Adjusters and O.B. Villeneuve Insurance for hosting the tournament. The annual Orientation and Annual General Meeting has been moved up to August 27. The Orientation begins at 6:30 and the AGM will start at 8:00. The Orientation is a "must attend" event for those individuals and their family members involved with Journeys and SMILE. You wanted it, so you got it: the tenth annual LiveWorkPlay New Year's Eve party will be an EXCLUSIVE event. You must be a LiveWorkPlay member or the guest of a LiveWorkPlay member to attend. 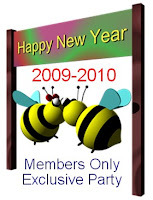 The 2009-2010 New Year's Eve In Ottawa party will be held at the Delta Ottawa Hotel and Suites in the Algonquin Room. Tickets are now available, and there are special room rates for those wishing to stay overnight. IT'S TRUE WHAT YOU HEAR: NEW GEAR! Yes, new LiveWorkPlay gear is finally here. There is new stock of men's and women's golf shirts in a variety of sizes and colours, and for the first time we are pleased to offer embroidered t-shirts so your logo won't wear out in the wash! The first public sale will be at the Orientation on August 27, but if you just can't wait, inquire at the LiveWorkPlay office. The LiveWorkPlay yearbook will also be available on August 27 for those who did not get a copy at Engines of Success. This year's edition is very special, it is two photography books in one: half the book covers events throughout the year, and the other half is beautiful photos taken by the SMILE photography group. We hope you have enjoyed this 31st edition of LiveWorkPlayNews. If you have received an email about this blog in error and/or you would prefer not to receive future LiveWorkPlayNews messages, simply click here and follow the simple instructions. That same web page can also be used by newcomers who would like to join LiveWorkPlayNews, so feel free to share the address with friends, colleagues, and family who might like to subscribe. Send story ideas to Keenan Wellar.